Priyanka Chopra Vs Deepika Padukone: Whose Met Gala 2017 Look Do You Rate Higher? Met Gala 2017: "Deepika is indeed the epitome of everything elegant," read a tweet while the general opinion on Twitter is that, in pristine white, "She looked like a beautiful and glamorous princess"
Baywatch: Priyanka Chopra's Victoria Leeds Has An Indian Connection? 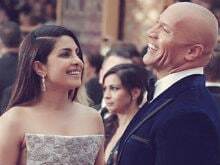 Dwayne Johnson, who co-stars with Priyanka Chopra in Baywatch, said, "Hard to balance real malevolence with charm and humour. Perfect choice for our Baywatch"